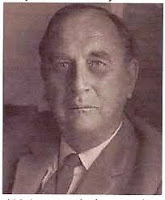 I have recently discovered yet another prolific writer of detective fiction whose books are mostly out of print and long forgotten. Born in 1903, Rupert Croft-Cooke apparently knew he wanted to be an author early on. By the age of 22, he had founded a journal called La Estrella and was working as a freelance journalist. His work appeared in numerous publications, including the American based magazine Poetry. He was a radio broadcaster for a short time during which he discussed the field of psychology. The year 1930 found him living in Germany, and in later life he spent time in Morocco, Tunisia, Cyprus, West Germany, and Ireland. By the time WWII began, Croft-Cooke had published dozens of novels, plays, and poetry selections, and his career was well on its way. However, duty called, and despite his age in 1940 (37), he joined the British Army and served in North Africa and India. He continued to write, penning quite a few pieces of nonfiction about his experiences during the war as well as some short fiction. He wrote two mystery series under the pseudonym Leo Bruce. The first features police office Sergeant Beef, and the second amateur sleuth/senior history master at the fictional Queen’s School Carolus Deene. Croft-Cooke wrote for television, including an episode for Alfred Hitchcock presents. 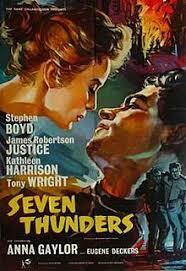 In 1957, his novel Seven Thunders was made into a movie. Starring Stephen Boyd (of Ben-Hur fame), the film is set in 1943 and tells the story about two British escaped prisoners of war. 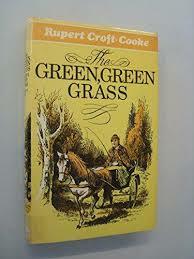 He passed away in 1979 having published his last book The Green, Green Grass two years prior. Did not know that! Very interesting!